For decades, the southeast region of the U. S. has been a center of activity in the world of marine turtle biology and conservation. With 5 species present (three nesting in significant numbers) and a host of significant threats, this region has attracted many scientists and conservation professionals as well as a virtual army of volunteers to assist in the recovery effort. Over the same period of time, the annual International Symposium has grown enormously in attendance and begun to span the globe. Far away places like Australia, India, or San Diego are great to visit but often out of reach for many interested and important “sea turtle people” that live and work right here in this particularly busy part of the world. 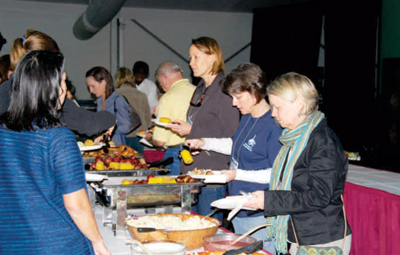 To allow greater involvement and educational opportunities for “Southeasterners”, the first ever Southeast Regional Sea Turtle Meeting was organized to focus on the unique conservation challenges and research innovations associated with coastal areas from Virginia to Texas. Beautiful Jekyll Island, Georgia, was chosen as the site, which brings many back to the 'roots' of the now International ISTS meeting, where it often convened in the late 1980's and early 1990's. The meeting was structured much like most academic symposia; there were various poster presentations available for the 400+ attendees to peruse during three days of oral presentations and workshops. To kick things off, esteemed biologist and author Dr. Blair Witherington gave the first of two keynote addresses, during which he encouraged us to think differently about our work by applying some Eastern philosophies to sea turtle conservation. The oral presentations that followed were divided into sessions by subject, and ranged in topics from hatchling energetics to satellite telemetry to the legalities of take limits in shrimp trawls. The second keynote address by Dr. Llewellen Ehrhart, of the University of Central Florida, started off the second day of oral presentations. Ehrhart did a fine job recapping the history and success of the Archie Carr National Wildlife Refuge. There was noticeable student involvement at this meeting, and the overall quality of the subject material and presentations was very high. In addition to the academic presentations, several social events were also planned. 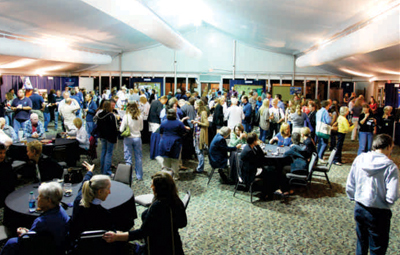 The opening social and “Low Country Boil” were great opportunities to informally meet with friends and colleagues, and the combined revenues from the silent and live auction raised over $7,000 to help offset future costs. There is a long list of those who should be thanked for making the meeting a success, but special thanks go to meeting president Kim Sonderman for leading the way, Donna Broadbent for logistical support, Janet Hochella for managing the vendors, Debbie Sobel for overseeing the auctions, and the Georgia SeaTurtle Center for being such kind hosts. 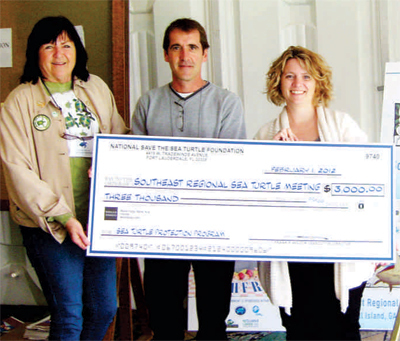 The National Save the Sea Turtle Foundation provided a substantial financial contribution of $3000.00 to the meeting, and also made a $1,000.00 donation to the Marine Turtle Newsletter, which was received by its Editor, Michael Coyne. 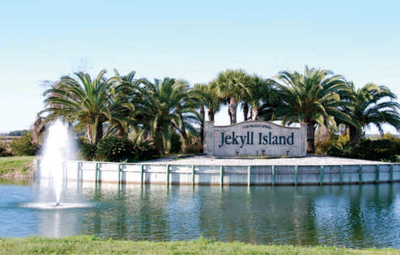 The next Southeast Regional Meeting is planned for Jekyll Island in spring of 2014. Helena Schaff, Director, National Save The Sea Turtle Foundation, Larry Wood, Conservation Biologist, Palm Beach Zoo and Kim Sonderman, President of Southeast Regional Sea Turtle Meeting. Entrance to beautiful JekyII Island, a delightful location for the meeting. 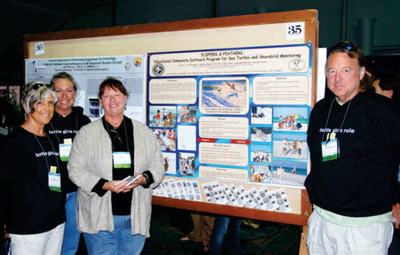 A poster with its authors standing ready to explain thier projects. Coffee breaks between lecture sessions were well attended. 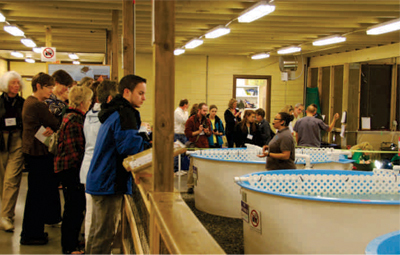 Visitors tour the Georgia Sea Turtle Center's rehabilitation tanks where turtles recuperate from all sorts of injuries. The center was adjacent to the meeting location.